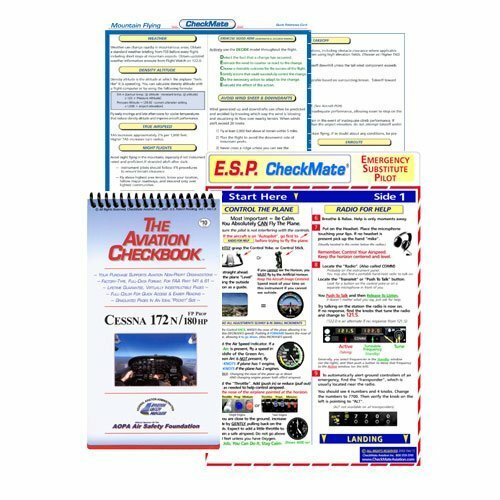 The most complete, highly endorsed and recognized aviation checklists in the industry! You'll realize CheckMate checklists' incredible value the 1st time you use one. Many endorsements from Instructors of the Year, independent Flying Magazines and Aviation Safety Organizations have said it best: "Very comprehensive and practical. A worthy contribution to aviation safety" - Rod Machado, Writer, National Speaker, National Accident Prevention Counselor, Western Region Flight Instructor of the Year.With over 300 aircraft models to choose from, CheckMate will most likely have the model(s) you fly regularly and in the future. CheckMate offers 2 sizes of each model single and twin engine aircraft. All data is included on both sizes. It's a pilot's personal preference that matters. CheckMate checklists cover Normal procedures and Vspeeds on the Front side and the most urgent Emergency procedures on the Back. Also included on the Back is a section displaying needed information for: weight & balance, fuel type & capacity, oil capacity, electrical size, and tire pressure. Trying to locate much of this data in the POH can be very time consuming and let's face it, lots of time isn't always what we have when flying an airplane.CheckMate Sizes:Standard size – 6.5" x 9"Compact size - 5" x 7"Some models also available in CheckBook Pocket Size 18 page flipbook. If you have any questions about this product by Checkmate Aviation, contact us by completing and submitting the form below. If you are looking for a specif part number, please include it with your message.